Are you constantly losing weight, only to gain it back again? If so, you’re not alone – many people have trouble maintaining their losses, even with the help of phentermine, and often find themselves back where they started time and time again. Although obesity is far worse for your health, this type of weight cycling, more commonly known as ‘yo-yo dieting’, can be very damaging for you physically and psychologically. So, while aiming to lose weight will always be the best choice, it’s important to take steps to ensure that this time it’s for good, rather than throwing yourself into another impossible-to-maintain fad diet. Here, we explain the dangers of yo-yo dieting and how you can make sure that you don’t gain the weight back after phentermine! Usually, yo-yo dieting is the result of trying to lose weight using extreme methods which are difficult to sustain in the long term, such as extremely low-calorie diets, or diets which exclude too many foods. These types of limiting diets make you feel deprived, tired and often depressed, and almost inevitably, you begin to revert back to your old eating habits, now with the added emotional effects of failing to lose weight through this restrictive diet. This emotional state can also lead to many people eating more than they would have before dieting, causing them to rapidly gain weight. Even when people are able to lose weight, using short-term methods to achieve this weight loss means that once they stop the diet, as many as 80% will gain this weight back. For this reason we see many members of our Facebook support group reporting that they are taking phentermine for the second time, while there are even some who have lost weight on phentermine several times, only to gain it back again. It’s understandable that people want to see results, but resulting to quick fixes means that dieters don’t then learn how to permanently change their way of eating, and will easily revert back to their old habits once they feel they have ‘finished’ with dieting. While diets have an end point, healthy eating does not .Without permanent dietary changes, weight gain is almost inevitable, and so the cycle of yo-yo dieting continues. Results into the long-term effects of yo-yo dieting are mixed. Some studies claim that it can lead to an increase in body fat, an accumulation of dangerous visceral fat around your middle, and a decreased metabolism, but others have failed to find evidence to support these claims. What is true, however, is that your metabolic rate slows as you get older, so with each new cycle of dieting, the same methods that you used before may become less and less effective, which can be very demotivating. So, weight loss becomes harder and weight gain becomes easier. Research using animal subjects supports this, as animals made to yo-yo diet were more efficient at gaining weight. It is suggested that this also may be as a result of increased hunger as a way of compensating for past deprivation, or in anticipation of future deprivation. Additionally, research shows evidence of a link between yo-yo dieting and increased health risks such as hypertension, high cholesterol levels, and gallbladder disease, although these are all also linked to obesity. Repeatedly losing and gaining weight may also be detrimental to psychological health; studies show increased levels of psychological distress and life dissatisfaction, and a lower quality of life among yo-yo dieters. Female yo-yo dieters were also found to have lower self-esteem, worse body image and reduced levels of self-belief. Are you prepared to change your lifestyle for good? If so then you’re already halfway there. However, if you plan to go back to your old ways once you’re done with phentermine then you’re more likely to go back to your old weight. They say that the biggest mistake we make is to expect different results from the same behavior, so change your behavior and your results will change too! Do your homework – read our inspiring phentermine success stories, take advice from successful dieters, find out the best foods to eat on phentermine, and make a plan to break the yo-yo dieting cycle for good! Dieting is short-term, but eating healthily is for life. You might be an expert in how many calories there are in every food after years of yo-yo dieting, but losing weight isn’t just a case of eating fewer calories – you need to be sure you’re getting your calories from the right sources. This means getting your vitamins, prioritizing protein, filling up on fiber, enjoying a range of fresh fruit and vegetables, getting enough calcium, and avoiding eating plans which exclude healthy sources of carbs. While the majority of dieters are likely to gain the weight back, it’s a different story when exercise comes into the equation. The National Weight Control Registry (NWCR) is tracking the weight loss statistics of 10,000 adults who have lost at least 30lbs and kept it off for over a year, and have found that 90% of these success stories exercise for about an hour every day. This doesn’t mean that you have to train for a marathon – just try to include more activity in your day, such as going for a walk at lunchtime. Exercise also has many other added benefits, such as boosting self-esteem and improving body image, therefore helping to undo the psychological damage that yo-yo dieting might have caused. If you were successful last time, what caused you to gain the weight back? Instead of looking back on your past attempts to lose weight as failures, try to pinpoint what changes or habits lead to you gaining the weight back. Phentermine can help you to adopt healthier habits which can then lead to long-term weight management, but identifying the key behaviors which lead to weight gain ensures that you’re better armed against these weight-gain triggers. For example, if you started getting back into bad habits due to stressful life changes, take steps to learn how to manage stress to avoid this happening again when life challenges you in the future. If you’re overweight or obese, losing weight in a healthy way will always be the most beneficial thing you can do for your health and wellbeing. However, the findings on how yo-yo dieting can affect your ability to maintain a healthy weight in future show that the best way to approach your weight loss journey with phentermine is to see it as a permanent lifestyle change. For this reason we recommend Phen Caps as a way to continue the good work you’ll achieve with phentermine. 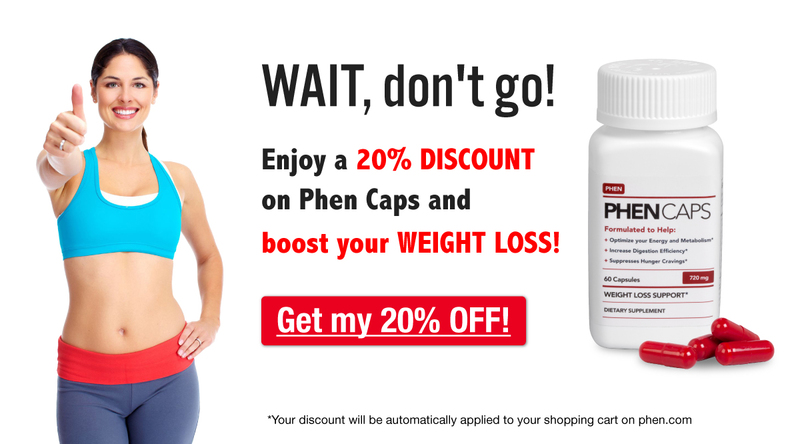 Like phentermine, Phen Caps boost energy and suppress appetite, so they can help you to continue your good habits until you’re ready to go it alone, giving you even more chance to break the yo-yo dieting cycle! Has your weight gone up and down in the past? Are you hoping that phentermine will help you to break the cycle once and for all? Let us know by commenting below!